Tracking attendance can seem like a tedious administration task for many teachers, trainers and instructors, but do it right and you can save yourself a lot of time and effort later. 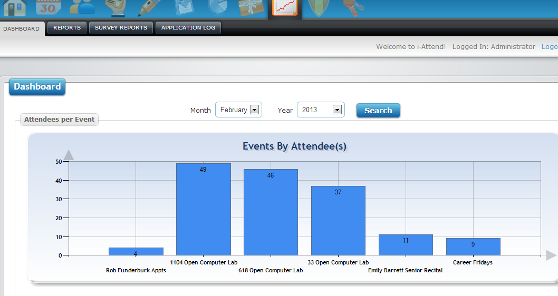 i-Attend provides an end-to-end attendance tracking system. Leverage your existing student badges, whether RFID or Barcode, for attendance tracking. 1. Extract Student Data from School's database. 2. Using i-Attend upload template, format the upload file. 3. Upload, Review and SAVE the uploaded data in i-Attend using the Attendee Module. 4. If using Barcode authentication, design and create name tags using the Name Badge Module. 5. Create your events using the Event module. 6. Capture attendance using Mark Attendance, Batch Attendance or Network Attendance Modules. 7. You can use an RFID reader, Barcode scanner or i-Attend Mobile to authenticate your attendees. 8. Run reports in real-time using the Reports Module. Organizations have policies and guidelines in place that need compliance. Such a policy can be Attendance Tracking for requirement meetings, trainings or events. i-Attend delivers the functionality and flexibility to enforce your HR, payroll, and union policies across the organization with regards to tracking and documenting attendance. 1. Create a private event using the Event Module. 2. 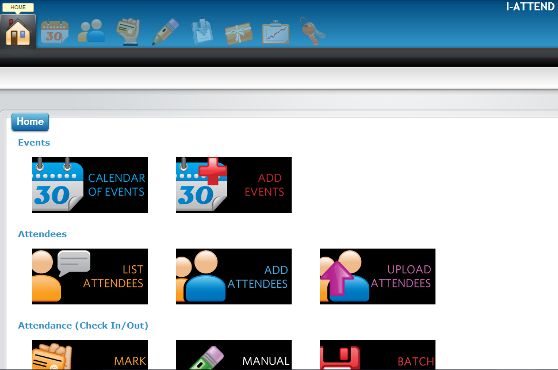 Create your event website customized with all your event information using the Microsite Module. 3. Inform your attendees to register to your event online by visiting the event website. 4. Create and design your name tags with barcodes using the Name Badge Module. 5. If using i-Attend Mobile, SYNC your tablets/ipads/phones with i-Attend Cloud . 6. If using i-Attend Mobile, capture attendance by using the device's camera to scan the barcode or attach a dongle RFID reader. 7. If using i-Attend Mobile, SYNC your attendance data to i-Attend Cloud after capturing attendance. 8. If using Barcode scanner or RFID, capture attendance using Mark Attendance, Batch Attendance or Network Attendance modules. 9. Run reports in real-time or download data to Excel (csv format) using the Reports Module. Attendance in courses to pursue Continuing Education Units needs to be documented. Whether you require RFID or Barcode tracker technology for your CE, CME, CLE, CPE or CEU Sessions Attendance Tracking requirements, you can count on i-Attend to deliver. 1. Create your events and assign points or credits to them. Attendees who attend will earn the points. 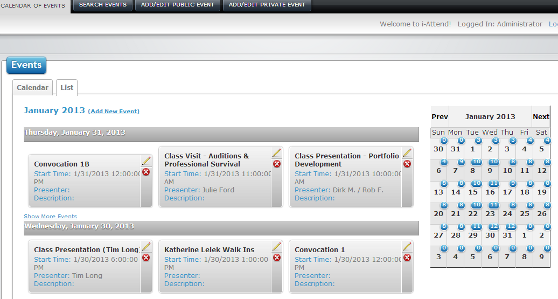 Use your imagination how to take advantage of the point system in i-Attend! 2. If you already have a list of attendees, simply upload them using the Attendee Module. 3. You can also create a custom event website that allows your attendees to register online using the Microsite Module. 5. Distribute the name badges to your attendees. 6. If using i-Attend Mobile, SYNC your tablets/ipads/phones with i-Attend Cloud. 7. If using i-Attend Mobile, capture attendance by using the device's camera to scan the barcode or attach a dongle RFID reader. 8. If using i-Attend Mobile, SYNC your attendance data to i-Attend Cloud after capturing attendance. 9. If using Barcode scanner or RFID, capture attendance using Mark Attendance, Batch Attendance or Network Attendance modules. 10. If you assign points or credits to your events, your attendees will earn those points/credits upon attendance. 11. Design and create your certificates per attendees using the Certificates Module. Use your imagination on the numerous uses of the Certification Module! Use this as rewards, certificates, INVOICE, etc. 12. Review, sign the certificates and distribute them to your attendees. 13. Run reports or extract data to Excel in real-time using the Reports Module. We have clients who use i-Attend to check for passes use in festivals, outings, movies, clubs, gates, etc. Each attendee has a unique badge id to identify them - use RFID or Barcode scanners to read and authenticate attendees. 1. If you already have a list of attendees, simply upload them using the Attendee Module. 2. You can also create a custom event website that allows your attendees to register online using the Microsite Module. 4. Create and design your name tags with barcodes using the Name Badge Module. We have two available templates (1) 2x3 (two badges across and 3 badges down), or (2) 2x15 (two badges across and 15 badges down). Use pre-formatted AVERY forms to print the badges on. 5. Distribute the name badges to your attendees on registration day or upon entry to your event. 6. Create your events for festival, annual passes, club passes or gate passes. 7. If using i-Attend Mobile, SYNC your tablets/ipads/phones with i-Attend Cloud. 8. If using i-Attend Mobile, capture attendance by using the device's camera to scan the barcode or attach a dongle RFID reader. 9. 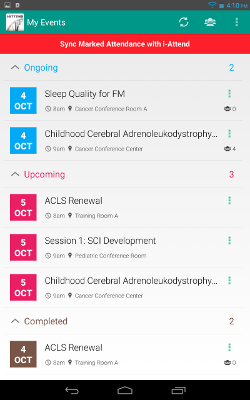 If using i-Attend Mobile, SYNC your attendance data to i-Attend Cloud after capturing attendance. 10. If using Barcode scanner or RFID, capture attendance using Mark Attendance, Batch Attendance or Network Attendance modules. 11. If you assign points or credits to your events, your attendees will earn those points/credits upon attendance. 12. Run reports in real-time using the Reports Module. Copyright © 2018 TNETIC, Inc. All rights reserved.